I am trying to set a mumble server up and I am having a bit of trouble getting my ACLs / Linked channels to work the way I'd like them too. Where people in the Root channel can talk and listen to both Red and Blue team, but Red and Blue team can't hear each other. The links I've been doing seem to make them all listen to each other. I've seen tutorials for similar things but I can't seem to apply them to my use case. Ideally I wouldn't need to assign groups to specific users manually, as there will be users coming in and out and they won't be registered. 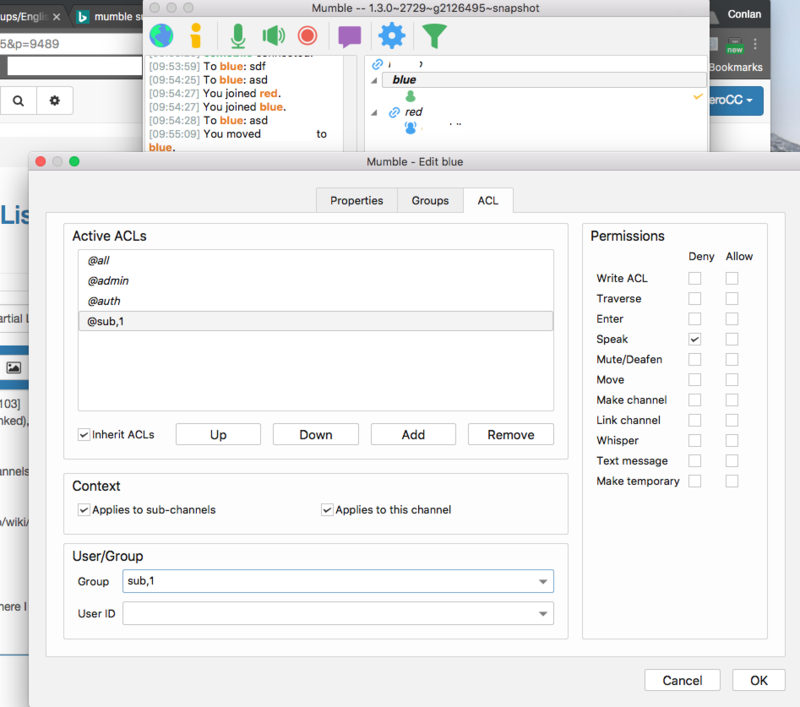 The @sub group can be used to specify ACL rules for channels of a common parent, in this case 1 above the channels in question. Hi again Kissaki! Thank you for the reply! I followed your steps but I'm still having some troubles where I can still hear both teams. I setup the ACLs like this for Red and Blue: https://i.imgur.com/DojCnQ7.png. I must be doing something wrong, but between the wiki and my googling I can't for the life of me figure out what it is. So I guess you'll have to make it a @~sub instead of @sub. I'm a little confused of how it is interpreted without it though.